Giant hogweed is a federal noxious weed, a non-native invasive plant and public health hazard which can cause severe burns, permanent scarring and even blindness. These very large plants also threaten biodiversity by shading and outcompeting native plants and can lead to soil erosion alongslopes and riparian areas. This year, 13 NYSDEC giant hogweed seasonal staff will be doing giant hogweed control throughout NY State using manual and chemical control methods. Control crews are based at DEC’s Avon, Allegany and Cortland offices and at the Montezuma Audubon Center; the hotline is located at DEC’s New Paltz office. Funding for 2014 is provided by New York State (Office of Invasive Species Coordination and EPF Fund) and US Forest Service. Last year we controlled over 680,000 giant hogweed plants and monitored 251 sites that had no plants post-control. 23% of all known giant hogweed sites now have no plants post-control and 67% of all sites now have less than 100 plants; our control efforts are really making a difference! To learn more about our program*s 2013 accomplishments please view our annual report online http://www.dec.ny.gov/animals/72570.html. The public has already started to call us about giant hogweed. From mid-June through mid-July, when the plant grows tall and flowers bloom, we will get hundreds of inquiries. Please direct all giant hogweed inquiries that you receive to the NYSDEC Giant Hogweed Hotline ghogweed@gw.dec.state.ny.us or 845-256-3111. The hotline is a place for people to report new sites, get help identifying suspect giant hogweed plants, ask questions about the plant and how to control it, and connect with our statewide control project. the plant, how to identify it, how to control it, a map of NY state sites, NYSDEC’s control project, and more. If you notice giant hogweed while you are doing field work please send an email to ghogweed@gw.dec.state.ny.us with photos of the plant and its location. 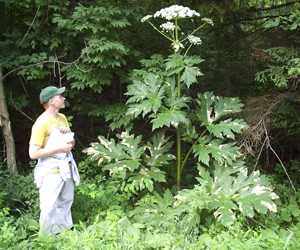 Visit our web site http://www.dec.ny.gov/animals/72766.html to learn how to identify giant hogweed. Please don’t touch the plant while taking photos.